Meet a family of fairies that is a little more modern and a little less pink than the norm. Plus, these fairies are on a mission. April and Esme Underhill are tooth fairies, although they have never actually collected a tooth before (their mum and dad always do it). At last it is their turn to give it a try so equipped with a bag, a coin and a mobile phone (I did mention they are very modern fairies) they fly to the home of a little boy, Daniel, who is waiting for a visit from the tooth fairy. 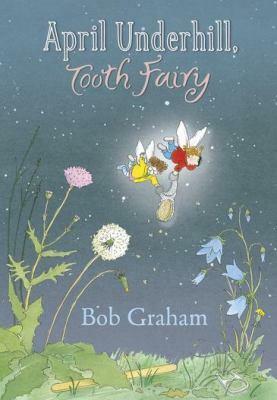 April Underhill, Tooth Fairy by Bob Graham has all the classic elements of a fairytale – a terrific challenge, suspense as April and Esme try to retrieve the tooth without being seen and of course a happy ending. I am a huge fan of Graham’s illustrations. His style is distinctive and the details appeal to children – pore over the pictures of the workshop where the fairy dad is tinkering and the bathroom where the fairy mum is taking a bath. Perhaps my favourite scene is when April is faced with the challenge of getting Daniel’s tooth out of a glass of water and quickly strips off and dives in – young readers may reconsider how they leave their tooth for collection next time! Apart from being a sweet fairy story this book also conveys the importance of being trusted to take risks as one grows up. The book finishes with the fairy mum telling April and Esme that they will take Daniel’s tooth to the fairy craft market the following day – I’m sure young readers will enjoy imagining what will become of it at the fairy market. April Underhill, Tooth Fairy is available from most bookshops or online at Fishpond for $17.97.